Get it? You should. Like miles on a car. While I was checking out my site stats on WordPress.com, I found out that I now have Followers and subscribers. That is exciting news. I REALLY wanted to share this with you. Why? Because you helped me achieve nearly 16,000 views here. Not in one year, of course! But that many views for two years is pretty darn impressive, right? I’m proud that I’ve worked so hard to get to where I am, and I’m especially thankful that you, my faithful readers, helped me get to where I am. Thanks for helping me get to where I am! I always knew that my faithful readers and subscribers were awesome! You are my superhero readers! The MOST Expen$ive NEW Motorhome to EVER Go on Sale! Are you getting tired of your Winnebago? Tried the Newell Coach? Not enough? Try the essence of luxury with the eleMMent Palazzo! It is 40 feet long, it costs a cool $3.12 USD, AND it’s on sale in Dubai! The master bedroom alone is almost as big as my room, and it has a 40-inch HD plasma TV. It comes with a built-in fireplace that can actually BURN REAL WOOD! In the unlikely event that that didn’t blow your mind, the rooftop cocktail bar complete with underfloor heating, a refrigerator, a fully stocked bar, and an ice might. Plus, it can reach a top speed of 93 MPH! The Newell Coach that I have in mind is barely half the price of the Palazzo. That’s affordable, right? The Top 25 Japanese Sports Cars That Enthusiasts Crave! For those of you who have owned a Japanese sports car, you know that they have the perfect balance of performance, practicality, and speed. My dad drove a 1970 Datsun 240Z, one of the most sought-after Japanese cars – ever! It was fast, barrels of fun, reliable, and easy to drive (if one didn’t mind the light, loose rear end). It was fast in the curves, but it could win in a straight line, as well. He could get 1/4 mile times in the 11.5 second range. He would pass Ferrari’s, Porsche’s, Lamborghini’s, and just about every other super car of the early 1980’s. But, he would be smoked by the time he reached 1/2 of a mile. He was topped out by then. He didn’t mind. One of our family friends owns a 1967? Datsun Fairlady Roadster. It’s a sight to see! It looks like a Triumph, but it’s way better! It seats the same amount of people, yet it weighs almost 300 pounds less. It’s also infinitely more reliable, and faster. I have compiled a list of the top 25 Japanese sports cars that enthusiasts give the thumbs-up to. Enjoy my list. 1969 Toyota 2000GT: The Toyota 2000GT was Toyota’s answer to the Porsche 911 and Jaguar E-Type. It was the unspoken answer. James Bond drove one in You Only Live Twice. 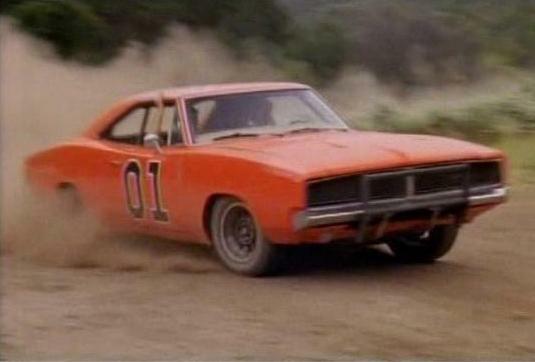 To this day, that chase scene is one of the best in movie history. The Toyota 2000GT looked like a Jaguar E-Type Coupe that sat two. However, it’s high price and exclusivity prevented it from becoming the Japanese Jaguar E-Type. 1970 Datsun 240Z: The Datsun 240Z was designed to be an affordable, faster, better-looking competitor to the Chevrolet Corvette and Porsche 911. The Datsun 240Z was powered by a 2.4-liter inline 6-cylinder engine making somewhere close to 200 horsepower. It weighed about 2500 pounds, so it went everywhere in a hurry. It could keep up with Ferrari 250 GTO’s on the track all day long, and shame a Camaro Z/28 in a drag race. This car was a rocket. Today, 240Z’s sell for about $25,000 for a good example. But, don’t buy one at an auction – Barrett-Jackson sold one in Monterrey for $155,000 in 2012. 1985 Toyota MR2: The Toyota MR2 was one of the smallest sports cars of the 1980s. It was also like looking at a race car. It had a mid-mounted 1.6-liter 4-banger that pumped out 125 horsepower. It revved to 9000 RPM, and had a cam for every 3000 RPM. It had a top speed of 154 mph, and it was stable in almost every condition. It tipped the scales at 1900 pounds. 1999 Toyota Supra: The Toyota Supra was the last true Toyota-built sports car. It was also a massive change in technology and direction for Japanese sports cars. It was powered by a 3.0-liter inline six cylinder engine that was boosted by twin turbos that ramped power up to a raspy 220 horsepower. It was fast, and it looked like it came out of rally-car racing. It had a massive rear wing, a raspy engine note that turned into a bellowing howl at redline, and meaty tires that wouldn’t look out of place on a Dodge Viper. This puppy wants to play. 1986 Toyota Celica AE86: The 1980s were the peak of lightweight sports cars. The Toyota Celica AE86 was no exception. It was based off of the AE86-generation Corolla economy car (that generation was the only generation of Corolla that was fun to drive!). It was light, insane, relatively powerful, good-looking, and fun to drive. My dad wanted one (he ended up buying a Honda Accord). So did most teens and young adults. That’s how good the Celica AE86 was. It left a lasting impression on everybody who drove it. 1996 Nissan Silvia S15: The Nissan Silvia S15 was the last generation of the wildly popular Nissan Silvia. It boasted a powerful 250-horsepower six-cylinder engine that was helped out by a massive turbocharger. At full throttle, it sounded like a F/14 Tomcat fighter jet. Tuners adored it. Paul Walker, star of the Fast & Furious series movies, owns a 580-horsepower S15 Silvia. 1990 Mazda MX-5 Miata: The 1990 Mazda MX-5 Miata turned the world around. Safety standards in the U.S. were so strict that it was almost impossible to build a light roadster. Mazda had the RX-7 (but it was powered by a rotary engine), but it was too heavy and large. Mazda built the Miata out of forged aluminum, which brought the car’s weight down to 2000 pounds. Other automakers were building cars that weighed 3500 pounds, because they thought it was more expensive to build cars out of forged aluminum. Mazda proved them all wrong. The 1990 Mazda MX-5 Miata is still one of the most amazing cars in the world to drive. 1993 Mazda RX-7 CSL: The Mazda RX-7 is one of the few cars to be powered by a rotary engine. The RX-7 CSL was a lightweight version of the popular RX-7. It was faster, and all models were built for Japan (right hand drive). Except for one. The only Mazda RX-7 CSL to have left-hand drive is at Mazda USA’s headquarters in California. 2007 Toyota MR-S: The Toyota MR-S is viewed to be the last sports car that Toyota built. Yes, Lexus and Scion build sports cars, but Toyota doesn’t anymore. Anyways, the Toyota MR-S paid homage to the MR2 of the 1990s, with a mid-mounted engine and front-wheel drive. While it may look like a chick magnet, it is one fast chick magnet. 2000 Acura Integra GS-R: The Acura Integra was one of the best-selling Acura’s ever. It had a high-revving I4 engine, a five-speed manual transmission, it was practical, and it was fast. All of that was put together into a tidy, sleek package. The final iteration of the Integra introduced the world to something called VTEC. While VTEC is standard on all four-cylinder Honda’s and Acuras, altered valve timing and valve lift was F1 stuff in 2000. 2006 Mazda Mazdaspeed 3: The Mazda 3 was already a popular economy car, but Mazda knew that they could get far more out of the car. They turned to their in-house tuner, Mazdaspeed. Mazdaspeed turbocharged the engine, put big, aluminum rims, sticky tires, a big rear wing, and torque steer. Torque steer is what Mazdaspeed is associated with nowadays. 2000 Mazda RX-8: The Mazda RX-8 may have ended production in 2011, but that doesn’t stop it from being on this list. 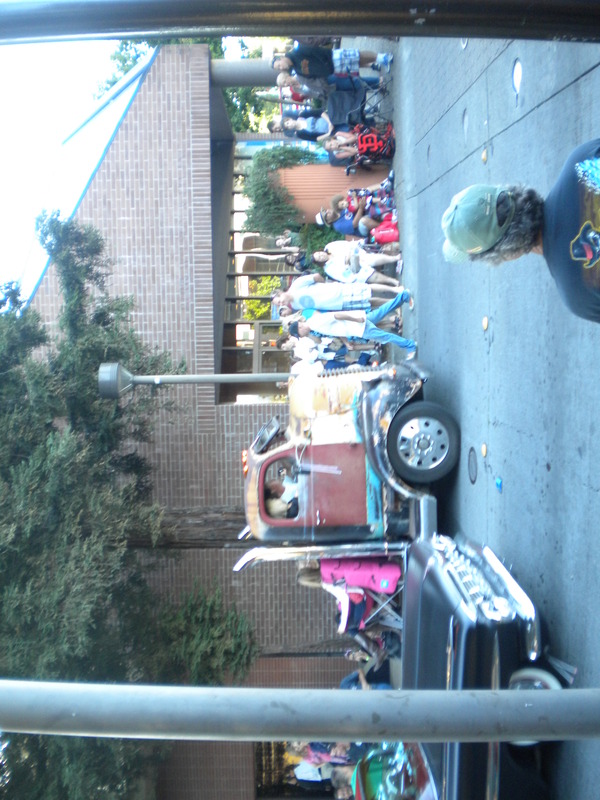 It had suicide doors (now only seen in pickup trucks), a rotary engine, and good looks. It also happened to be heavy and under powered. Nothing stopped people from loving, however. 1998 Nissan 240SX: The Nissan 240SX was popular here in the States. Not only did it have stunning looks, but it had performance to match it. Unfortunately, the only engine we got here was a 2.4-liter four-banger from the Frontier pickup truck. 1986 Nissan Pulsar GTI-R: This car could not be built again. It was a subcompact hatchback that could barely squeeze two adults into the tiny cabin. The GTI-R took performance to a whole different level. It was built to satisfy World Rally Championship homogilation rules. Only 5,000 baby Godzilla’s were built, but they were fast. Fast as a bat out of hell. It had a turbocharged engine, AWD, and lots of bodykit add-ons. 2009 Nissan GT-R: The Nissan GT-R has been around for over 40 years in some form or another. Godzilla was Motor Trend’s 2009 Car of the Year. It packed a twin-turbocharged 3.8-liter V6. Nissan has come out with various iterations of this generation of the GT-R. The most recent is the 2013 Nissan GT-R Track Pack (the fastest stock Nissan to date). 1988 Honda CRX Si: The Honda CRX was one of the fastest econoboxes of the 1980s. It was light, extremely fun to drive, and stylish. Plus, it was based off of the wildly popular Civic. The CRX Si was the final CRX. In the U.S., it came with a less powerful I4 than Japan’s. That ushered in the era of Honda shade-tree mechanics. 2003 Nissan 350Z: The Nissan 350Z brought back affordable, quick, sportiness to the world. It was about the same size of the 300SX, but it didn’t have two turbochargers. It had a powerful naturally-aspirated V6 that garnered praise from automotive journalists around the world. The engine was so sweet that Nissan still uses it for many of their V6 cars. 2000 Acura Integra Type-R: Yes, I know that there are two Acura Integra’s on this list. They deserve to be. Especially this one. The Integra Type-R was the last Integra made. It got the Type-R treatment (lower weight, more power, more looks, more chassis-stiffening). It was also the most stolen Acura to date. 2000 Honda S2000: Most people celebrate their 50th birthday with lots of friends and family. Honda built a very special car. The Honda S2000 was a track-oriented beast of a car. It had a 237-horsepower engine, rear-wheel-drive, and perfect balance. A manual transmission helped a lot, as well. 2009 Subaru Impreza WRX STi: Subaru took the hum-drum Impreza, turned it into a rally-rocket with a turbocharged engine, a manual transmission, and lots of bodywork. Then, Subaru’s rally team got their hands on it. They built the raucous Impreza WRX STi. STi stands for Specially Tuned Impreza. It is fast, practical, and barrels of fun. It’s the equivalent of a bouncy ball coming out of a gumball dispenser. Unfortunately, it’s ending production. Buy one while you can. 2010 Mitsubishi Lancer EVO MR/GSR: This is possibly the most radical Mitsubishi ever. It has a 291-horsepower turbocharged I4. It also has a dual-clutch transmission pulled from rally cars. AWD is standard. Datsun 510: The Datsun 510 closely resembles a BMW 2002 Tii. Why? Why not? Japanese automakers used to build their cars in a similar fashion to their European competitors. It came with fully independent suspension, a Positraction rear end, a five speed manual, and a high-revving four-banger. It was a hoot to drive. Acura NSX: The first widely produced Japanese exotic car sent Ferrari, Lamborghini, Porsche, and Chevy scrambling for the drawing board. It changed the definition of super car. In my eyes, it’s the most influential Honda ever. If that wasn’t a big enough slap to Ferrari, Lamborghini, Porsche, and Chevy, F1 driver Ayrton Senna assisted in the development of the car. Scion FR-S/Subaru BRZ: The Scion FR-S and Subaru BRZ may only have 200 horsepower, but they are so perfect at what they do that it’s not even funny. They are rear-wheel-drive beasts on winding roads and tracks. Just don’t drag race anything other than a Smart Car. You’ll lose. Badly. This Guy Could Be the Next Tosh.0 Star! One might think that you would have to be drunk or high to crash your perfectly good car into a tree to test out the airbags. You might also think that you can stuff your airbags back into their containers for another round of tree-bashing. Ehh! Please try again! You might even think the German man who did all of these things was clearly under the influence of some other psychotropic drug, if he wasn’t drunk. Try again. Uwe Schrager, a German man, attempted to add to the already-large world of automotive research. When police and emergency response crews arrived at the scene, the perfectly conscious Schrager explained his methodology: He had crashed into concrete walls at lower speeds, before deciding to test out his hypothesis on an innocent tree. Poor tree. Police are currently evaluating him for psychiatric issues. Coverage from the 11th Annual Peggy Sue All-American Cruise! 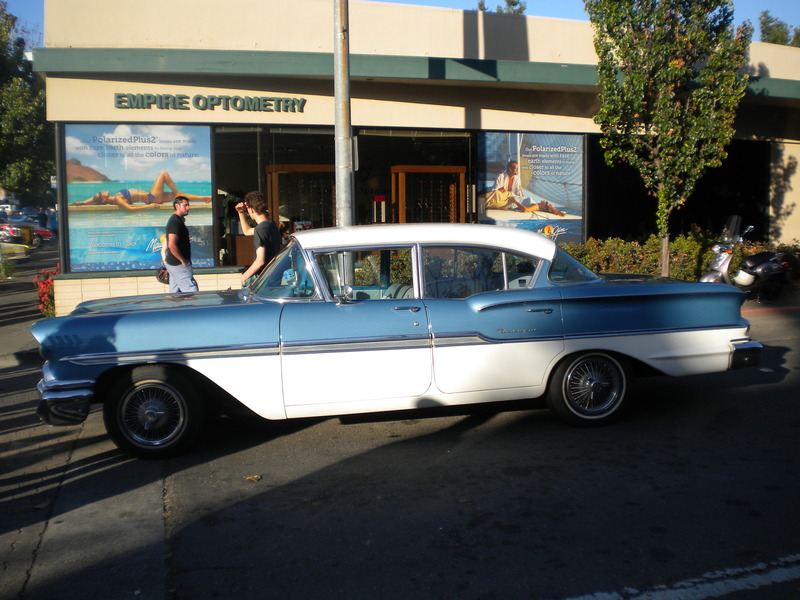 Every year, the Peggy Sue All-American Cruise and its related events take over sunny Santa Rosa, CA. 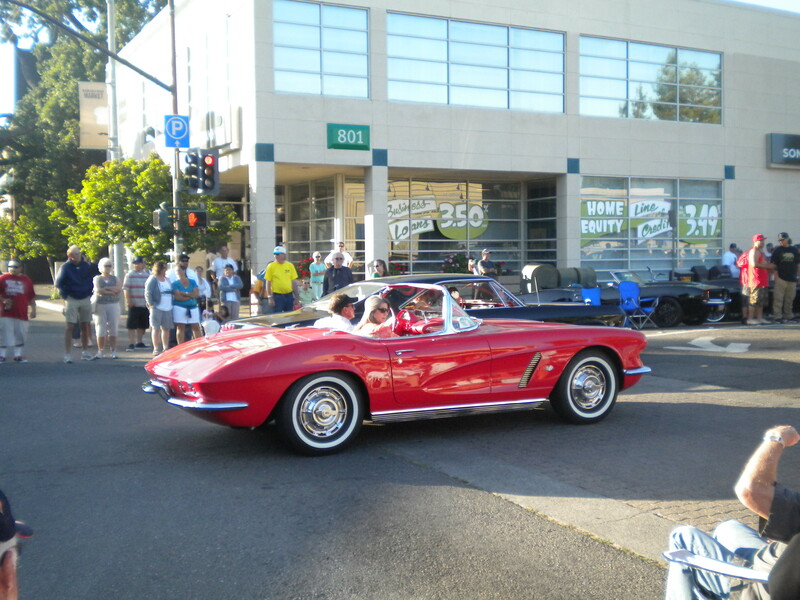 Restored cars, hot rods, low riders, raised Jeeps, and antique American cars are all part of the mix. We have entered our 1950 GMC 100, “Betsy” twice. It’s always been a lot of fun for me to see all of the classic cars in the parade or the massive parking lot where they are displayed! 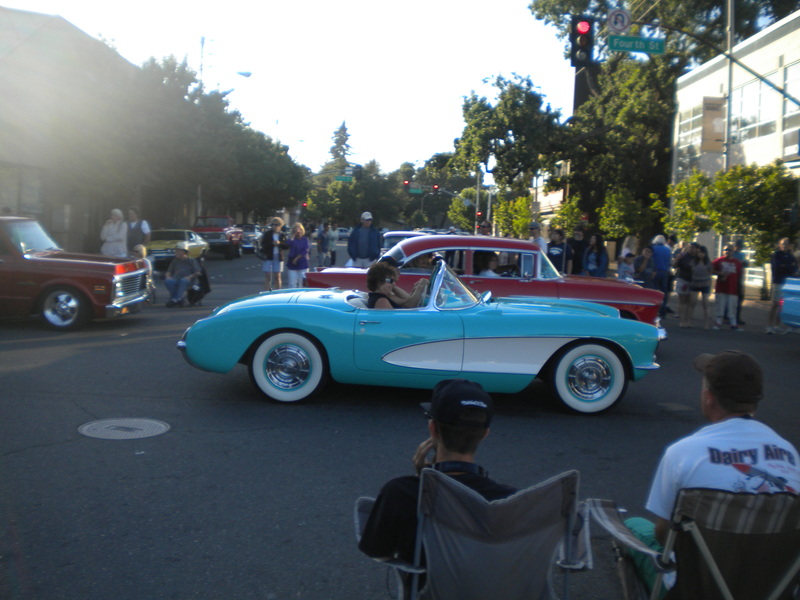 This year, one of my good friends joined me in watching the classic American cars cruise around downtown Santa Rosa. Revving engines? Check. Drunk people yelling at drivers to “Step it up, dude!”? Check. Squealing tires? Check? The smell of burnt brakes? Check. Annoyed and overworked event staff? Right on. I know that you are getting bored reading my words about what was going on. I’ll cut to the chase: It was a LOT of fun, and you should join me next year. Enjoy the pictures. I don’t know what this Chevy Nova had under the hood, but it sounded NASTY! 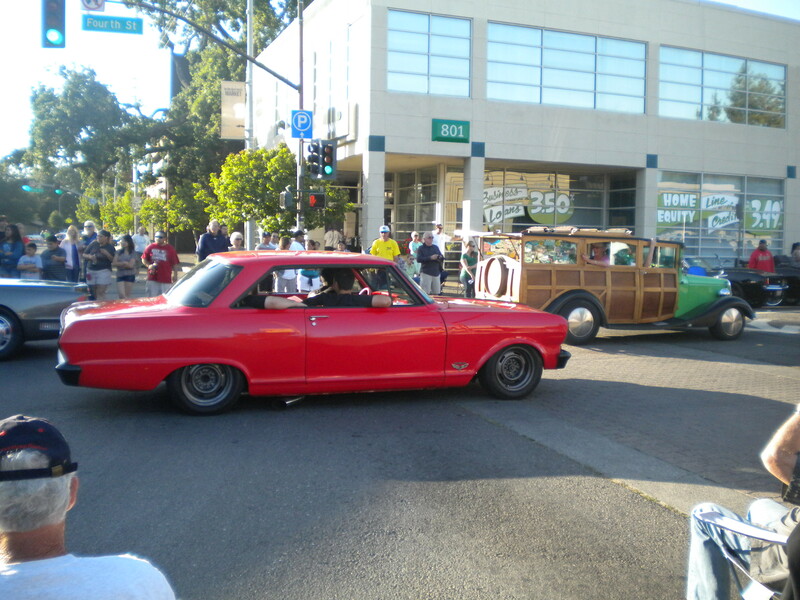 Many of the cars at the parade were either restored to Concours-levels or were built for the drag strip. This one was built to rule the streets. This 1959 Chevrolet Corvette is a rare “Fuelie.” Instead of a carburetor, it has a primitive version of fuel injection. This particular example was restored to a “Level 1.” Level 1 means that it is virtually perfect. That it is. 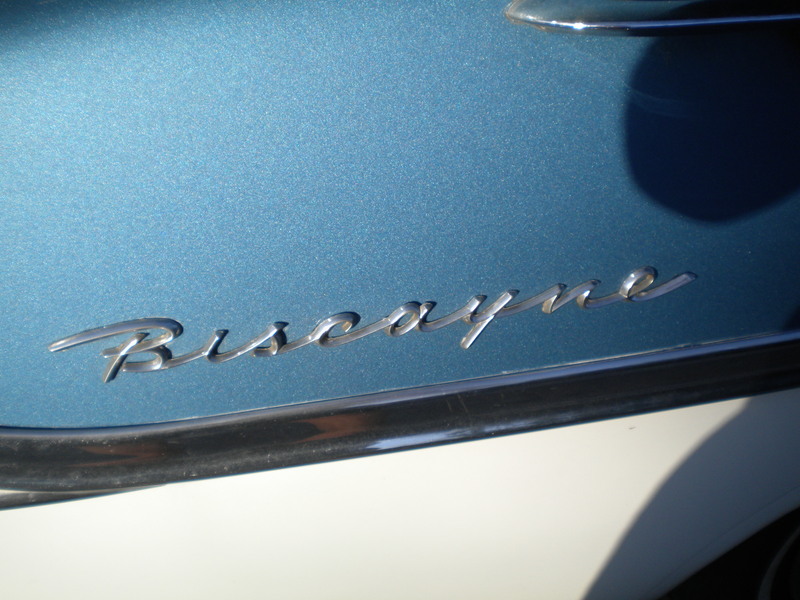 This 1966 Chevrolet Biscayne is a powerful, efficient, and stylish family sedan from the muscle car era. It has a 327 cubic-inch V8 engine and a two-speed automatic Powerglide transmission. It’s lovely. I find it nice that the interior of the same Biscayne matches the exterior of the car. 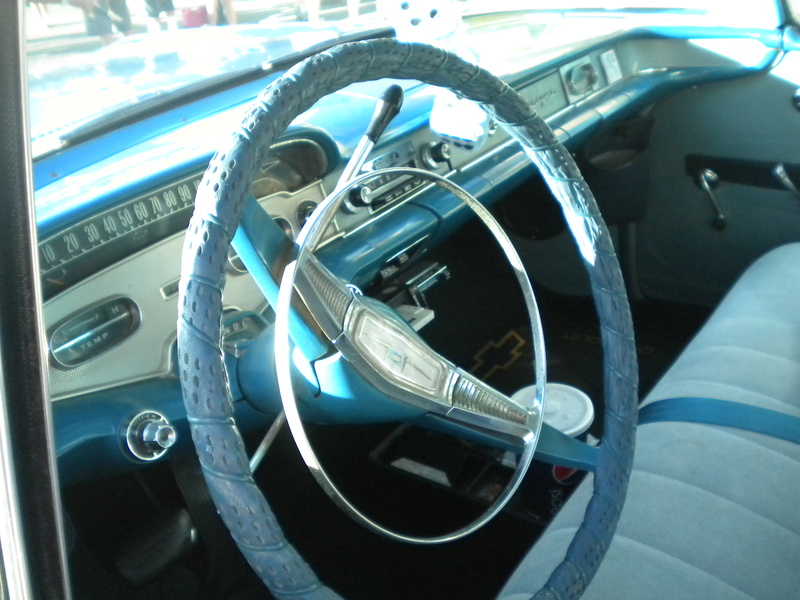 Even the steering wheel has chrome on it! Same car. This is the model designation. The car is a barn find from somewhere around Redwood City, according to the owner. He restored it himself, and he did a very good job of it! For those of you old enough, you should remember the aero-wars days, when big engines and aerodynamics were all the rage. The 1971 Plymouth Roadrunners and Superbirds were the car of choice for many famous NASCAR drivers. Richard Petty left Ford in 1969 to go to Plymouth. 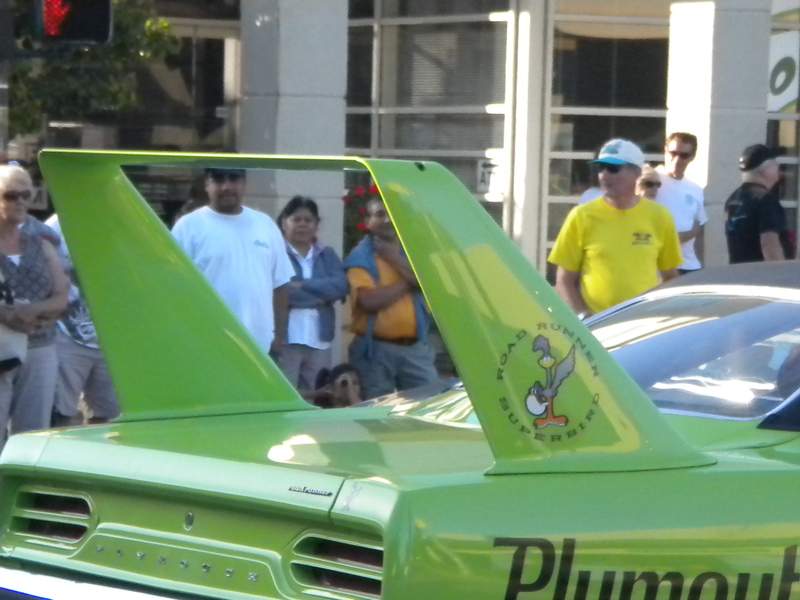 He did so much better in a Plymouth Superbird that Ford built the Torino Talladega as a response. This particular Roadrunner has the 440 Six Pack (a 440 cubic-inch V8 with THREE two-barrel carburetors! ), which was just one step below the mighty 426 Hemi engine. 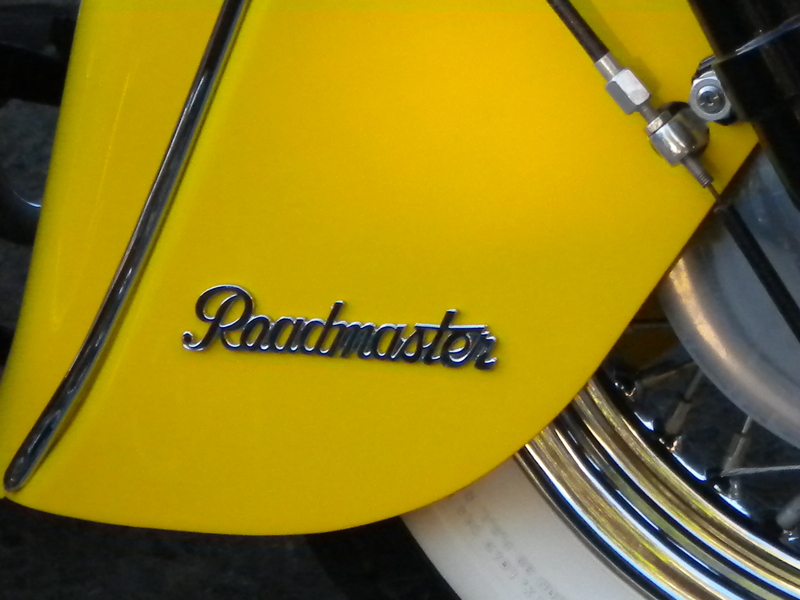 It is painted in the iconic Lime Green that is popular with automotive restorers. This Corvette is one of the nicest Corvettes that I’ve seen in a LONG time! It is painted Aqua Blue and Snow White, with a matching interior. It has the 283 cubic-inch V8 and a four-speed manual. It is a 1956 Corvette. The only shame? That it’s far too nice to tour Route 66 in. Sorry about the fingertip on the top of the camera view. The sun was shining and I REALLY wanted to tell you about this truck! 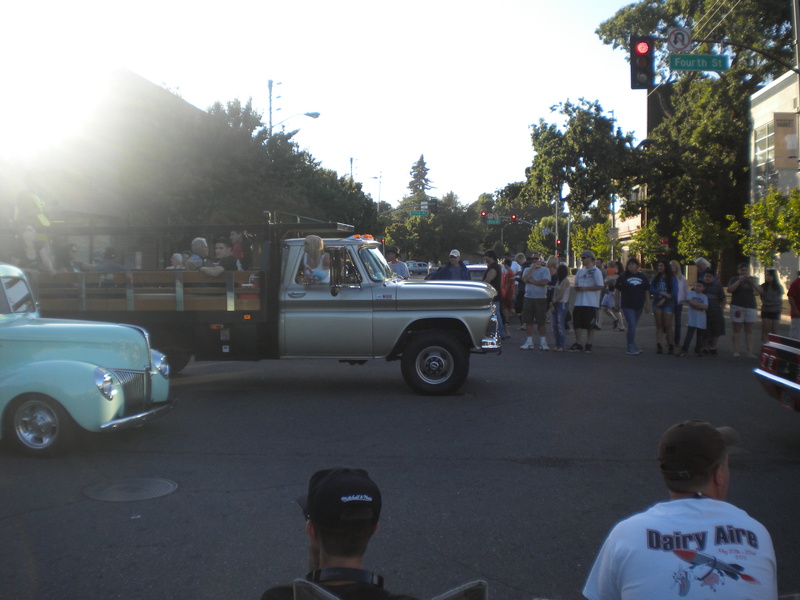 It’s a 1965 Chevy K10 with the optional 327 cubic-inch engine and a three-speed manual. It is built to tackle any trail, and take anything that you want with it. 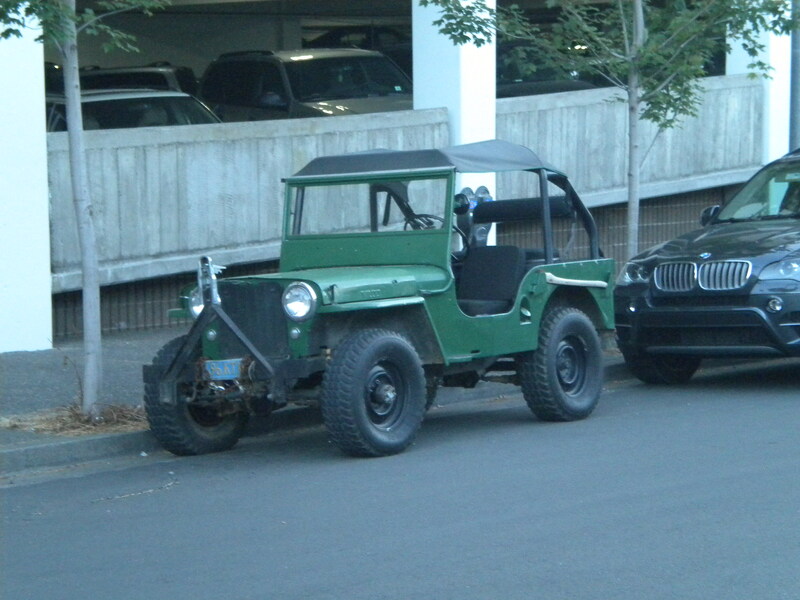 It may not be stock, but it looks like it will outrun just about any Jeep from the same era off-road. 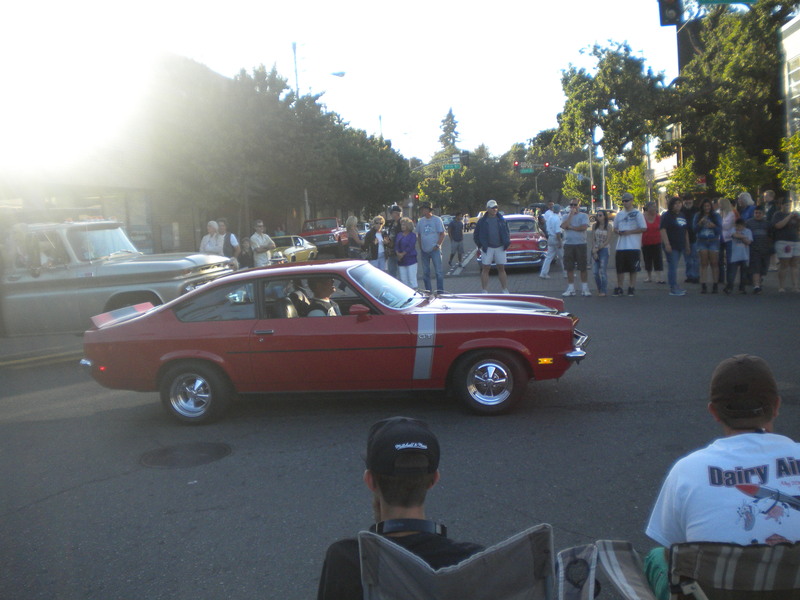 Remember the Chevy Vega? If you don’t, it’s okay. The Vega was powered by a 305 cubic-inch V8. It was relatively powerful and fast, but it was a minor disaster for Chevy. This Vega is a 1974 model. It wasn’t the nicest car there, but it was one of the newer cars there. The best part about this 1969 Chevrolet C30 is that it is used a lot. 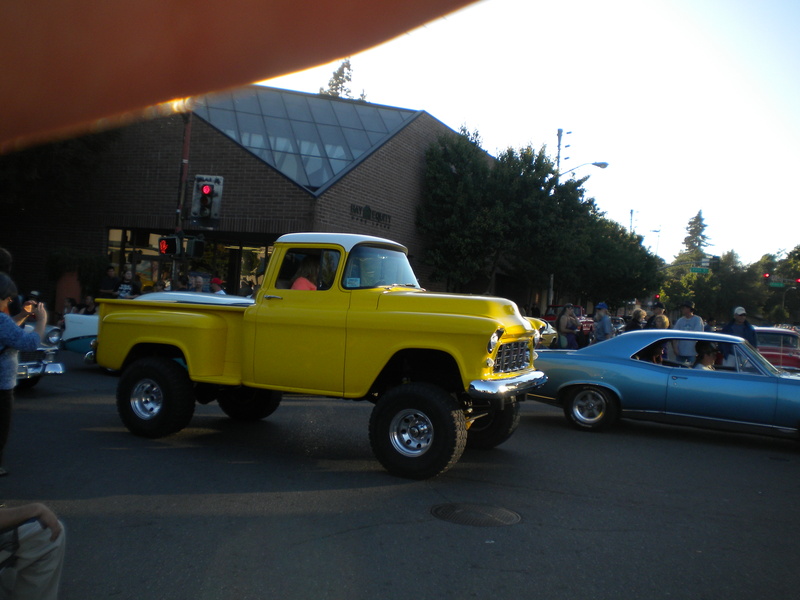 I don’t know how much, but I have seen it at Sonoma Raceway’s Wednesday Night Drags as a tow vehicle. It’s the perfect tow vehicle. It’s got a 350 cubic-inch engine that’s all-original. So is most of the truck. This rare 1971 Pontiac Firebird Trans Am is one speedy car. It’s all stock, and plenty fast that way. It’s got the 350 cubic-inch V8 engine found in many GM vehicles from 1969-1999. The top speed is 130 mph. This car means business. The lucky driver had to keep the car in first gear. he also kept touching the brakes because the car wants to leap forward. Lucky him. I’m going to apologize in advance for the direction of the photo. This 1951 Dodge cab-over semi has been so heavily customized that the only thing original about it is the cab. That’s it. The rest of it is custom-built. The truck is a heavy-duty car-hauler with three axles. The engine is a brand-new 6.7-liter Cummins Diesel engine that has two turbos instead of one. Wow! 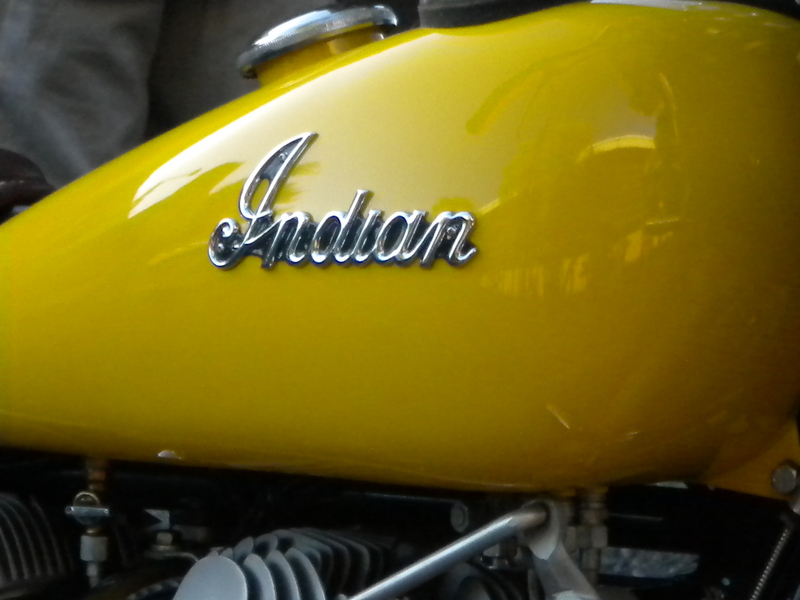 The Indian logo is still in the original chrome, almost 65 years later. The gas tank can hold 10 gallons. It says that on the chrome gas cap. 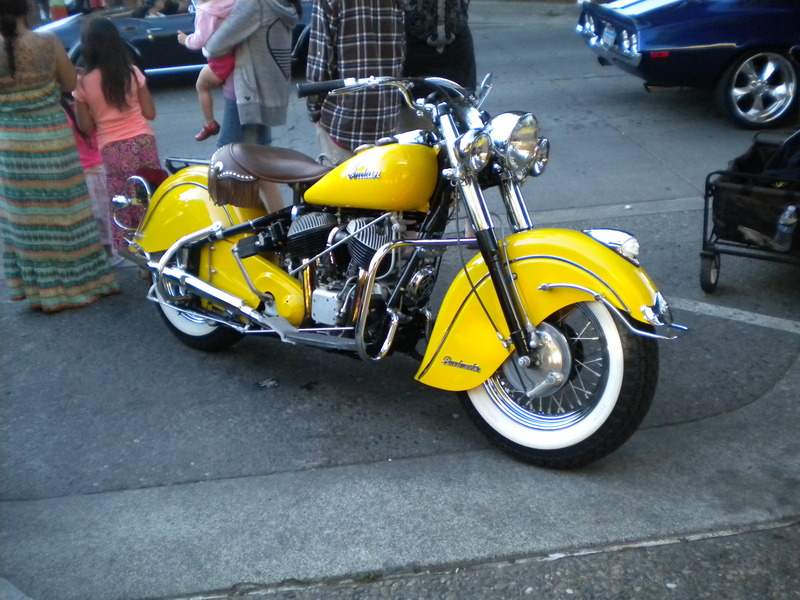 I like the way that Indian made the front wheel cover so stylish. 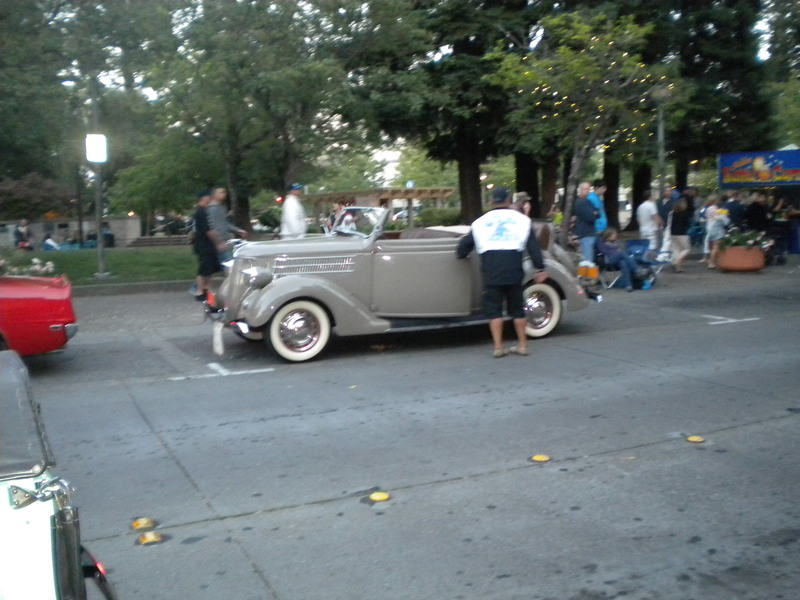 I was talking to the owner for a minute, and I found out that he drove it all the way down to Santa Rosa from Healdsburg. That’s not a lot of fun on an old motorcycle, yet Indian motorcycles are built to cruise. I’m guessing that it was probably a comfortable ride down to Santa Rosa. This Ford Bronco looks like it came out of some post-apocalyptic movie. It’s got aggressive tires, a six-inch lift kit, and a 302 cubic inch V8. I don’t know the exact year, but it looks like it’s from around 1967-8. 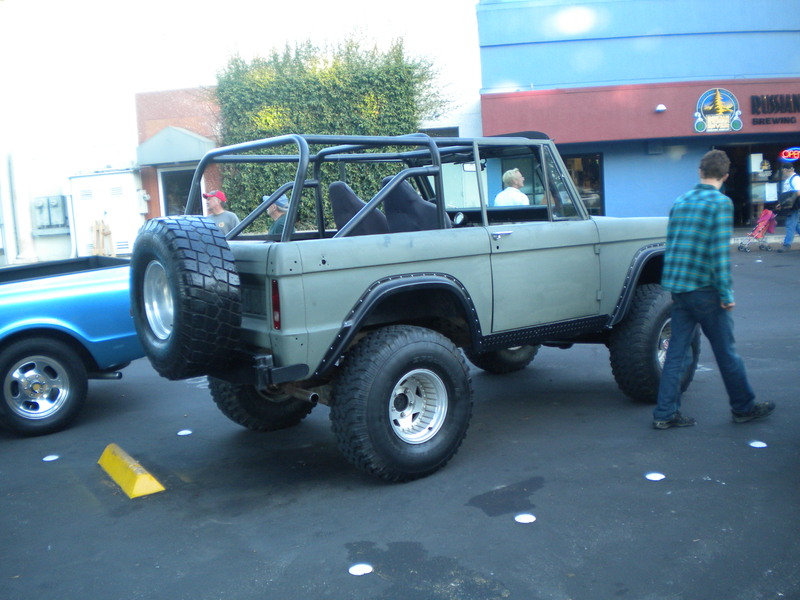 This is one nice Bronco. This is one of the coolest, most amazing Jeep CJs that I’ve ever seen. And that’s saying a lot. This CJ is stock, and is a 1947 model. Between the drivers seat and the passengers seat, there is a metal rifle/shotgun holder for two high-powered guns. Not that it would be used for that! 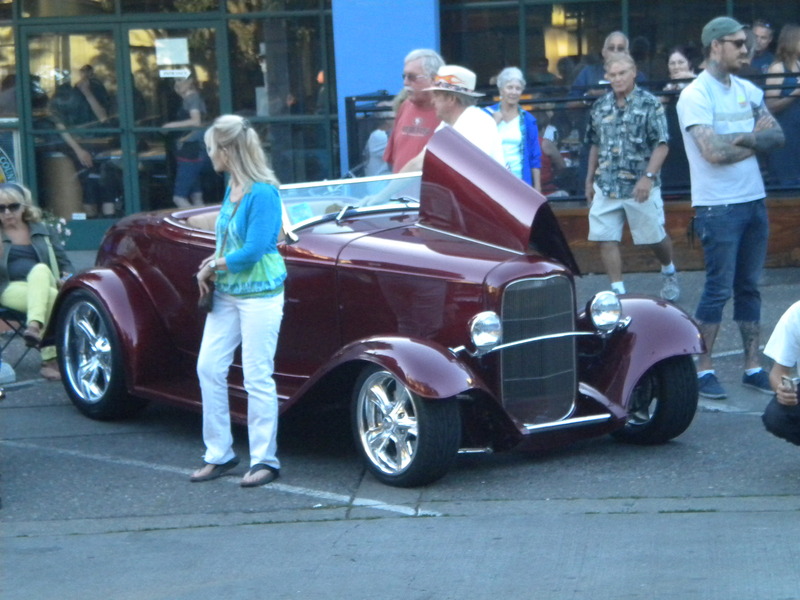 How often do you see a stock 1932 Ford roadster? Not at all often! This is a stock 1932 Ford roadster that could sell for upwards of $150,000 in its current condition. It even has the rumble seat and the original interior! It’s beautiful! I’m sure most of you know of this already, but the, er, unfortunate, uneducated soul on CNN a few weeks ago called the latest addition to the Dubai Police Force the Lamborghini AvenTadoor. Not the Aventadoor, the AvenTadoor. Sounds like something out of Star Wars, right? Well, let’s try and forgive her (I can’t, but somebody might…)…Anyhow, the Dubai Police Force is just itching to pull some of those Saudi Midsize Hooners (YouTube “Saudi Midsize Hooners” to see what I’m talking about!)! It’s true. The Dubai Police Force has gone and done it. They went out and bought a Lamborghini Aventadoor LP 700-4. While it has a top speed of 217 mph, don’t expect for them to go cruising around at those speeds while eating donuts (or whatever Middle-Eastern cops eat by the ton)! The Aventadoor is going to be used to deter owners of high-powered supercars and/or promote tourist areas in Dubai. This probably means that there are going to be pictures of friends in Dubai. Sitting in the car that you wish you drive next to some Saudi Arabian cop who’s the same size as Arnold Schwarzenegger. Okay, that’s an exaggeration, but who cares, anyways? While no changes have been made mechanically to the car (it’s so powerful and cop-ready that it doesn’t need to have any mechanical upgrades), there are some regulatory changes made to the interior. Inside, there is an advanced video monitoring system, a GPS data logger, a radar gun, and other necessary police equipment. A set of flashing lights has been added to the roof that’s less than 3 feet off of the ground! This is not the first time that a Lamborghini has been enlisted for police duty. The first Lamborghini to be used for police service was a 2008 Gallardo LP 560-4 that was bought by the Italian State Police. Until now, the fastest police car in the Middle East was a 2011 Nissan GT-R used by the Abu Dhabi police force. Now, they’ve got a Lamborghini Aventadoor, a Chevrolet Camaro SS, a Ferrari FF, and a 2013 Ford Mustang Boss 302. Those are some spoiled cops! I know that many people have done similar posts on the best muscle cars ever. It’s generic. I DID NOT take any of their lists for this post! Since the Ford Mustang is 1 year away from 50, I thought that it would be nice to honor the Mustang and its competitors through the ages. Enjoy. Since Ford broke created the muscle car segment in 1964 with the Mustang, there have been many other cars that have redefined the term of muscle car. Every car buff will crack a grin when he/she sees one of these muscle cars. Below the description of each car, you can drool over the picture of the car. 1964 Ford Mustang: The Ford Mustang created the muscle car segment. To this day, it is still a sales and performance leader. Plus, it’s got looks and heritage to back it up. You can’t beat the good ol’ formula of a big V8 engine mated to a manual transmission and rear-wheel-drive. Ford says that they might add their EcoBoost V6 to the Mustang. Whatever they do, I’m hooked! 1970 Buick GSX: A derivative of the already-amazing Buick GS, the GSX added crazy into the mix. It had a monstrously underrated 455-cubic-inch V8 engine that Buick rated at 360 horsepower and a thundering 510-lb-ft of torque. They say that such a car can never be built again. They’re right! Only 678 1970 Buick GSX were ever produced. 1968 Pontiac Firebird Coupe: If you think of the Pontiac Firebird, a bland, uninspired 1990s coupe comes to mind. If it’s not that, it’s the hood icons from the 1980s, right? 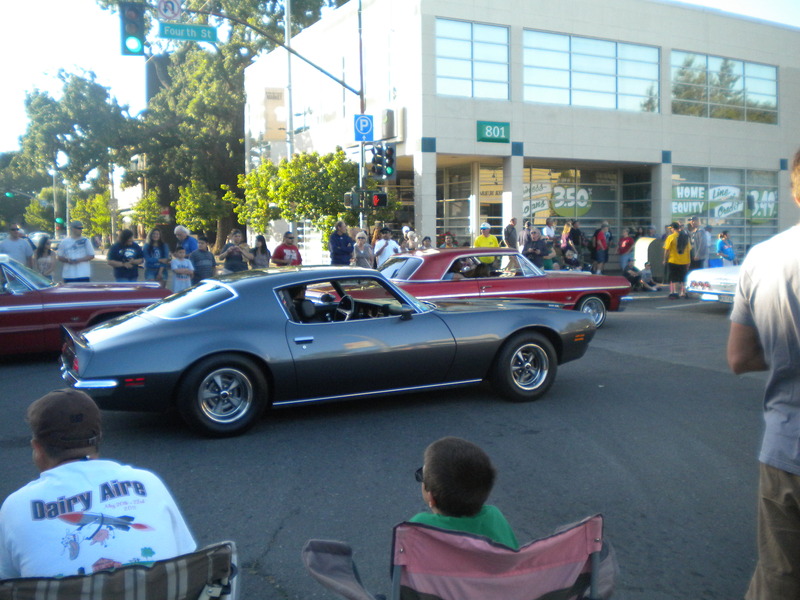 But, the Firebird goes back to 1968, when the muscle car era was in full swing. 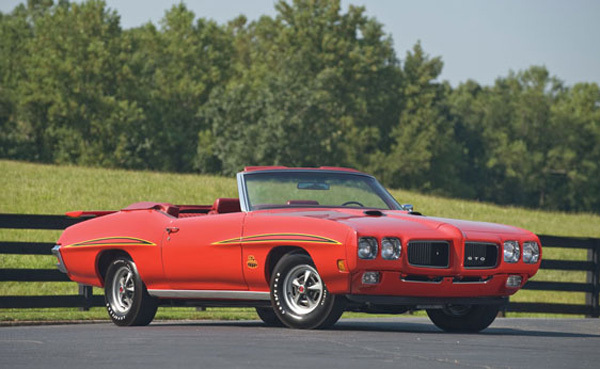 It came with a bellowing 400-cubic-inch V8 that was good for at least 335 horsepower. Then, there were the small blocks. But, that’s another story for another time. 1969 Plymouth Roadrunner: The Plymouth Roadrunner was a cheaper, stripped-down sister to the Plymouth Superbird favored by Richard Petty. The 440 Six-Barrel Roadrunner models had no hubcaps and a lift-off fiberglass hood. Most hoods stayed off. That engine was almost as fast and nearly as powerful as the smaller, lighter, and more powerful 426 Hemi for which Mopar ruled the dragstrip with. The economical-yet-fast 383-cubic-inch small block was a good option for the budget-conscious. The car shown below is a 440 Six-Barrel Roadrunner in Mango Orange. 1970 Chevrolet Chevelle 454 SS: The Chevrolet Chevelle was already a fast car, but Chevy wanted to be the biggest, baddest, fastest, of them all. They shoehorned a 7.4 liter (454 cubic inch) V8 into the car. It made a totally bonkers 450 horsepower at 2000 RPM! It represented the limit of the horsepower wars. To this day, it is still the most powerful stock big-block engine ever made. 1965 Pontiac GTO: The Pontiac GTO scared the living daylights out of cops, Ford, Chevy, and Mopar. It was based on the already-quick Belvedere coupe. It weighed a scant 3500 pounds, it eventually offered a 455-cubic-inch engine, and it was fast. Scary fast. 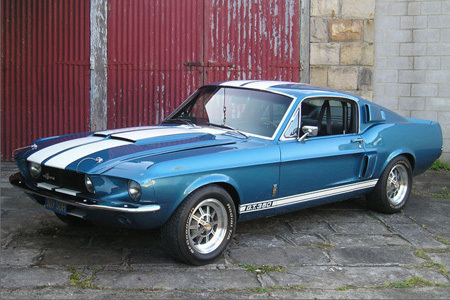 It ruled the streets until 1968, with the introduction of the Shelby GT500KR. 1969 Chevrolet Camaro COPO: COPO stands for Central Office Production Order, which is where all of the orders for the cars come into. To thank the tireless staff, Chevrolet built a Camaro that ruled the dragstrip well into the 1980s. It was street-legal, and only 69 were built. 27 owners returned them because they were too fast. Go figure. It had a 427-cubic-inch V8 under the hood. 1970 Plymouth Hemi Barracuda: The AAR Cuda was the fastest, with its walloping 426 Hemi V8 engine. It was offered with no less than FIVE high-horsepower engines, a four-speed manual transmission, and dragstrip times into the low 13-second range. While its nose-heavy weight distribution made for sketchy handling, nobody was digging their fingers out of the dashboard when they were going down the dragstrip (if you don’t know what I am talking about, watch Planes, Trains, and Automobiles!). 1970 Ford Mustang Boss 302: Ford wanted to beat Chevy in Trans-Am racing, so they had to build a car that would win. The size limit for the engine was 302 cubic inches, and Ford made use of every single cubic inch. It was grossly underrated at 290 horsepower, which matched the also-grossly-underrated 290 horsepower of the 1969 Chevrolet Camaro Z28. That was good for a 0-60 time under 7 seconds, and a quarter mile time of 14 seconds. While it wasn’t a COPO Camaro, it certainly was fast. 1969 Chevrolet Camaro Z28: Guaranteed to stir emotion in any automotive enthusiast’s heart, the Chevrolet Camaro Z28 was a total monster of a car. It had a 302-cubic-inch V8 that was severely underrated at 290 horsepower. While Chevy fans moaned and grieved about the new small-block V8, it sparked the fire that started the legendary 350 V8, and the slough of small-blocks after it. Little was left to be desired. 1967 Shelby GT500: Essentially a factory-authorized tuner Mustang, the Shelby GT500 had a Ford Police Interceptor 428-cubic-inch V8 stuffed under the hood. It was one of the fastest cars of its day on the dragstrip and the roads. A version of the GT500 was used for Gone in 60 Seconds. 1970 Ford Mustang Boss 429: The costliest Ford at the time that wasn’t a Shelby was the Mustang Boss 429. Ford wanted an engine to use for NASCAR, so they had to build at least 1,000 cars with that engine for homologation reasons. The car was perfect for races such as the Daytona 500. 1966 Shelby Cobra 427 S/C: Quite possibly the rarest Shelby ever made, the Cobra 427 S/C was a twin-turbocharged version of the already-speedy Cobra 427. It made an estimated 480 horsepower at the wheels. One was made for Bill Cosby. The other was made for Carroll Shelby, the man who invented a legend. Bill Cosby sold his because it was too fast. Its next owner put it into a lake at 130 mph. Shelby’s was sold in 2007 for a massive $5.5 million. The Cobra S/C shown is Shelby’s Cobra S/C. 1968 Chevrolet Corvette L88: The L88 was an engine destined for NASCAR. It made 550 horsepower. Chevy had to build at least 1,000 cars for homologation purposes. They ended up building over 8,000. 1970 AMC Javelin Rebel Machine: While AMC is best known for the Gremlin and the AMX, the Javelin Rebel Machine was one screaming machine! The engine was the standard AMC 390-cubic-inch V8. For just $500, you could get over 400 horsepower and a quarter mile time in the high 12-second range. 2013 Ford Mustang GT500: The Mustang GT500 has been a staple of epic burnouts and horsepower. The 2013 Mustang GT500 makes 662 horsepower from a supercharged, 5.8-liter V8. It goes to 60 in a scant 4.0 seconds. Ford claims that the GT500 can go 200 mph. Motor Trend got the GT500 all the way to a ridiculous 197 mph. But, given a long, flat, straight piece of road, there is no doubt that the GT500 will go 200 or more. I’m sensing my readers setting something up (hint, hint!). 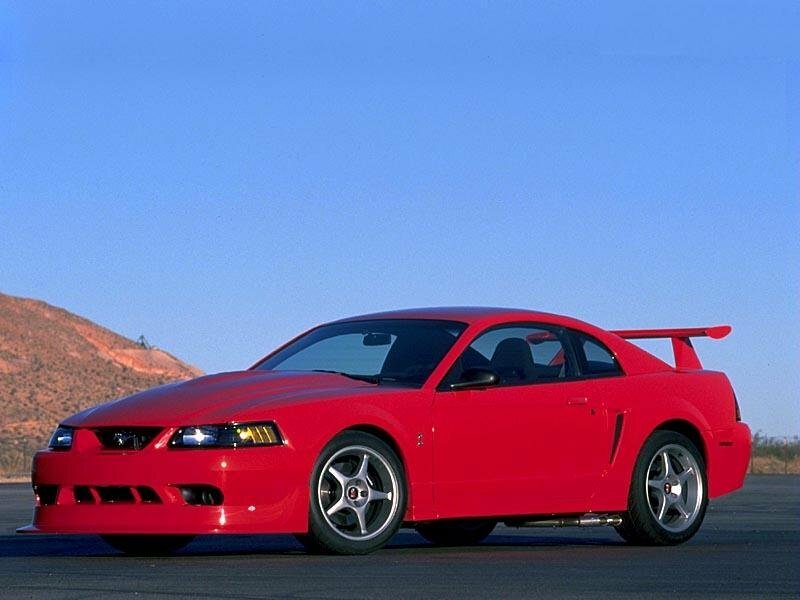 2000 Ford Mustang Cobra R: The Ford Mustang Cobra R showed the world that the 1960s were NOT a bygone era. It was fast, and it looked like it was straight out of Fast & Furious! It packed a walloping 385 horsepower and 385 lb-ft of torque from a 5.4-liter V8. That meant that it has one of the best exhaust notes you’ll ever hear! It’s still one of the most capable American cars to ever hit the road. 2002 Pontiac Firebird WS-6 Trans Am: After 35 years, the Pontiac Firebird and Trans Am models flared out. However, they weren’t going to go out without a bang. It made up to 345 horsepower from an all-aluminum engine, and it looked speedy. Had GM not killed Pontiac in 2009, it is highly likely that the Firebird would have been sold alongside the Chevrolet Camaro. 2004 Mercury Marauder: They say that rugby is a hooligan’s sport played by gentlemen. I don’t doubt them. The Mercury Marauder was the fastest American sedan of its day. It gave out an ominous appearance, and it was adequately fast for the average grandparent. Thanks to the bench seats, limited-slip differential, and the aluminum driveshaft and upgraded transmission, it was the last cool Mercury built before Mercury was axed in 2011. 2012 Dodge Challenger SRT8: The Dodge Challenger has long held a special place in my heart. Why? Because it looks amazing, it’s fast, and it’s loud. It offers exclusivity, speed, comfort, power, and an unforgettable exhaust note. Plus, there’s 24 paint schemes to choose from. Then, there’s the pinstriping that Dodge offers. 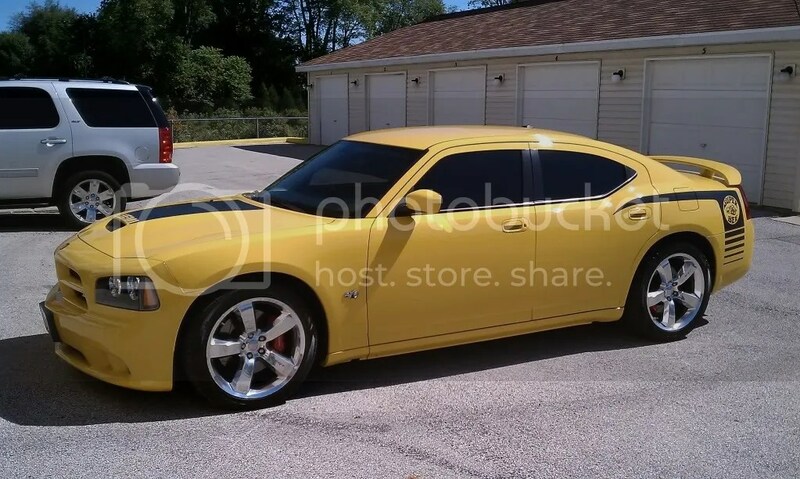 2008 Dodge Magnum SRT8: Exclusivity? Check. Speed? Check. Looks? Check. While the Dodge Magnum was a Dodge Charger station wagon, it never quite lived up to its name. That is, until Dodge took the Charger SRT8 and turned it into the Magnum SRT8. If you want to embarrass your neighbor who thinks he’s cool because he owns a Camaro SS, take him to the dragstrip and challenge him to get to 60 mph before you. He won’t. 2009 Ford Mustang Bullitt: If you watched the Steve McQueen movie, Bullitt, then you’re probably wishing that your significant other will get you a Mustang that looks and handles like the one used in the film. He/she shouldn’t spend a lot of money on a bad-handling old Mustang that sounds good and looks cool. Well, they should, but the 2009 Mustang Bullitt will always hold a place in any Ford Mustang enthusiast’s heart. It’s 4.6-liter V8 gave 15 more horsepower to the driver, it had absolutely no badges on it, and it was painted Highland Green, just like the original. 2010 Chevrolet Camaro SS: The Chevrolet Camaro SS may have vision that is worse than a bunker with no windows, but it looks cool, it’s fast, and it can embarrass a lot of fancier, more expensive cars around a track (in some versions). The manual SS has 426 horsepower from a slightly detuned Corvette LS3 engine. If you want even more exterior/interior styling, get one with the RS package. It adds cool lights to the headlights, it has unique rally-style gauges, and it’s a bit faster. 2013 Chevrolet Camaro SS 1LE: Quite possibly the best-handling Camaro…ever. The Chevrolet Camaro SS 1LE is a track-day monster that can be driven every day. Easily, happily, and quietly. It starts off as the Camaro SS, but it then adds the 1LE performance package, which adds wheels and brakes from the ZL1, and various suspension bits from the Corvette ZR1.